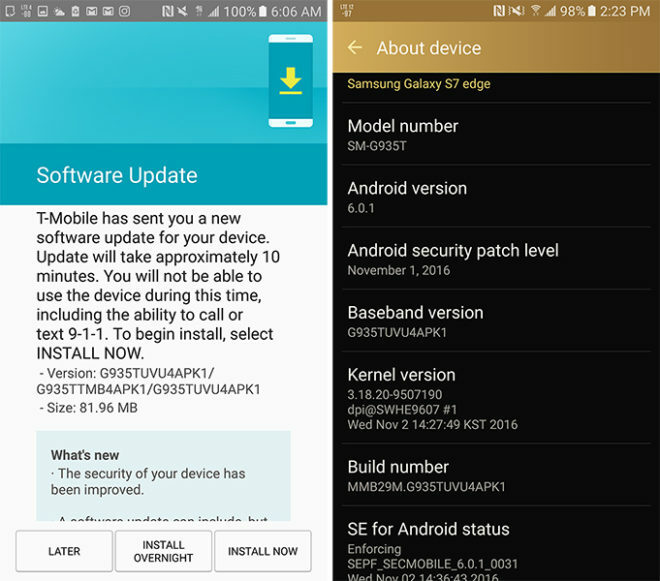 UPDATE: It looks like these updates did enable 256 QAM and 64 QAM on the Galaxy S7 and S7 edge. Qualcomm pinged me today to say that T-Mo has updated both phones to support 256 QAM for downloads and 64 QAM for uploads, and some users on Reddit are seeing increased network speeds after installing their phone’s update. Samsung Galaxy S7 and Galaxy S7 edge owners, you’re getting new software updates to kickstart your weekend. T-Mobile is now pushing updates to its Galaxy S7 and S7 edge, with the former moving to version G930TUVU4PK1 and the latter getting bumped up to G935TUVU4APK1. The Galaxy S7’s update appears to be 82.10MB, while the Galaxy S7 edge’s is 81.96MB. The included changelog for the updates says “The security of your device has been improved,” and indeed, these updates include the November 1 security patch. 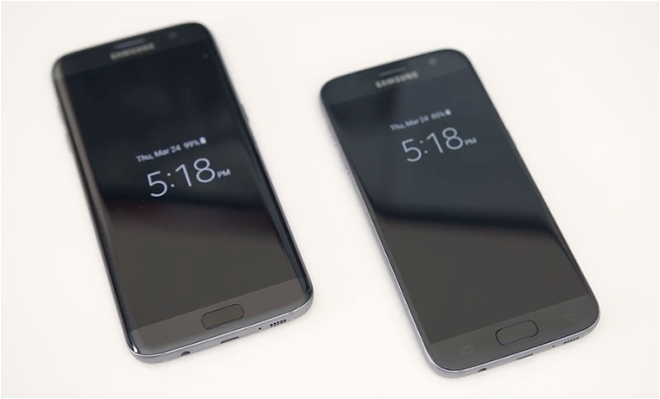 Has your Galaxy S7 or S7 edge gotten its update yet? Editorial Director of News and Content for PhoneDog Media. Arsenal, beer, video games. Can be found on Twitter at @alw. QAM (quadrature amplitude modulation) is a method of combining two amplitude-modulated (AM) signals into a single channel, thereby doubling the effective bandwidth. QAM is used with pulse amplitude modulation (PAM) in digital systems, especially in wireless applications. OMG I just did the update and now my Galaxy S7 turned into a Windows 10 phone. Thanks Obama! Mine turned into a V20! No data speed increase here. Don’t know about QAM, but the phone seems slightly less laggy in general. That could just be because of a cleared system cache because of the update process. I’m guessing more crowd testing is needed to see if QAM is enabled. Either that or Tmo let’s us know. Anyone use social media? I won’t do FB or Twitter so someone else ask if it’s enabled with this update. My speeds are greatly increased after the update. Can Note 5 do 256 QAM and 64 QAM capabilities ? Can my Samsung Galaxy A 7 (2016) be upgraded to Nougat Version. They had a beta program, but the queue is full, so we missed our chance. Gotta wait for the final nougat update to come out later this year – hopefully before end of year. Still getting same speeds. 20 meg download, 10 meg upload. All this QAM talk is nonsense. You are seeing faster speeds because you just rebooted your phone for the first time in a month. I have to reboot my phone every copuple of days or it’s unusable. Even then it’s BARELY useable. This is the sluggiest, laggiest phone I’ve had in years. Might be time for a factory reset. I would lose my mind if my phone was that sluggish. It has to do with the built in storage just being too small and the sd card reader being an older generation slow one (caps out at like 60-80 when there are cards and readers that go up to 270). It’s unfortunate that everyone cried for SD cards and then Samsung chose to cut the internal memory to do that. It makes the phone a step backwards in performance and convenience from my s6 with 128 internal storage. This update was not QAM at all…..the increase in speeds is due to the cache clearing on your phone and the RAM getting a breather from the reboots. Subsequently, Samsung just pushed out an update to those with the remaining Galaxy Note 7’s which shortens the charge span/limit of the batterie to 60 percent. While the Edge does not have these problems, something tells me they (Samsung) did the same to the Edge on the down low as in, “better be safe than sorry.” I am so glad I didn’t bite the bullet on the current Samsung flagships models. Everyone was affected across the board. Either get the LG V20 or the Google Pixel. Otherwise, wait for next March for the release of the Galaxy 8 series flagship devices. And no I don’t wear a tinfoil hat, I just get the feeling this incremental update is sort of consequential from all the BS concerning anything marked Samsung at this point. Just me two cents. That’s false. Upload speeds do not increase over their previous maximum if roughly 40mbps which was the 20mhz band 4 max throughput before 64QAM. And both 256QAM and 64QAM were enabled together. I’m not so sure. My local site has had 20Mhz of B4 spectrum live for awhile now. Post update, I’m getting roughly ~20% more speeds on both download and upload. I’ve never hit 123mbps DL and 45mbps UL in this spot before. Update result: My phone is a tiny bit less laggy than it was – still slug; It runs INCREDIBLY HOT NOW and it didn’t prior to this update; and my internet speeds test out SIGNIFICANTLY slower than before this update. I used to get anywhere from 5-15 in my home. Never lower than 5, rarely higher than 15. Now I can’t top 2.8. So. Sigh. I guess I’ll have to reset the phone and see if that helps. Why are android updates always like playing russian roulette? I live near Houston, and work near the Port Of Houston, work night shift, my download speeds haven’t increased but my upload speed has, before tonight I never got above 35mbps, and now I am getting 40+ & 50+mbps upload speeds. Nearly 2017 and LTE is finally maturing!!! This update bricked my phone…endless start up boot to the point of getting my phone to recovery boot screen that also is in endless cycle…. If this is true…then the V20 must have it enabled straight out of the box cause I’m seeing speeds as high as 140 down and 30 up with average of 60-70 down even during peak times! This update is killing my battery life. It’s not even 11am and my s7 edge is already down to 45% after the kind of usage that would normally result in maybe down to 80%. And it’s also running warm like another poster brought up. Same here. It feels like I have to wipe my phone every time there’s an update…. Mine keeps getting a rainbow colored screen now. It’ll just be off, and I look at it to find the screen is lit up all wild and it’s pretty hot. This is just within.. an hour or so of having the update. Also charging is slow as all hell now. Pretty cool. Just found out it was the screensaver in settings.. what the hell kind of feature is that? Who in their right mind wants a screensaver on a phone? Every since this update my phone randomly drops signal. I have to reboot phone. I have this SW in my phone, so will I need to update my phone?, what would be the effect to have the phone in this release.